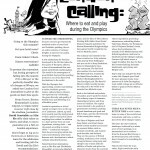 Going to the Olympics this summer? Got your hotel resos? Check. Event tickets? Check. Dinner reservations? Gahhhh! To prevent the convenient but boring prospect of falling into the nearest Prêt a Manger or the perfectly dreadful idea of a burger at Wimpy, we asked two London food journalists to give us the goods on their fave spots. From Dinner, Heston Blumenthal’s London outpost, to vegan eatery Counter Café close by the stadium, journalists David Constable and Qin Xie offer their takes on where, and what, to eat to guarantee you a full-on London experience. There has never been a better time to visit London, home to some of the world’s best restaurants and bars, as well as host of the 2012 Olympic Games. This year, the city’s culinary landscape, bolstered by a whole score of new openings, is as international as its visitors — from the Russian Mari Vanna to the Peruvian Lima and Ceviche, there’s bound to be something for everyone. Visitors don’t have far to go either. Right outside the main Olympic Stadium is the recently opened Westfield Shopping Centre, offering a small cluster of eateries. The likes of Franco Manca, Pho and Comptoir Libanais, all part of small chains, wave the flag for good food at accessible prices. For something more unique in London, visitors should head west on the Central Line. Stop briefly at Bethnal Green to sample Nuno Mendes’ creative fare at Viajante and Corner Room. Mendes, previously of El Bulli, never fails to plate up interesting flavour combinations. Close by is Shoreditch, more easily accessed via Old Street Station, the area of London where some of the trendiest bars paint a unique map of cool. Callooh Callay and Nightjar are some of the East End’s favourites. A constellation of gems can be found around Soho, where eating and drinking integrate seamlessly. Oxford Circus is your portal to this gastronome’s paradise. This is where you will discover Italian wine bar and restaurant Dego with its unusual Champagne and Franciacorta list. If wine is really your thing, do stop by Terroirs near Charing Cross for some of the most interesting natural wines around. Proceed further south to discover NOPI, the restaurant that’s a unique Yotam Ottolenghi blend of Mediterranean, Middle-eastern and Asian cuisines, where the restrooms are as much a talking point as the food. Nearby is Hix, the bar and restaurant that feeds London with some of the meatiest feasts and the most potent cocktails. Just to the east of NOPI is where you’ll find Polpo, part of Russell Norman’s mini-empire of small plate eateries. Always busy, this bacaro offers Venetian décor matched to Italian cichetti and Aperol Spritzes. And across the road from Polpo is Bob Bob Ricard, described by some as a “pleasure palace,” where sumptuous delights await in the form of champagne and caviar. 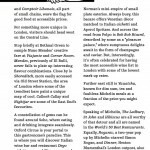 But, interestingly, it’s often celebrated for having the most accessible wine list in London with some of the lowest mark up rates. Further east still is Yauatcha, known for dim sum, tea and faultless Michelin meals at a fraction of the price you might expect. Speaking of Michelin, The Ledbury, St John and Hibiscus are all worthy of that detour and all are named in the World’s 50 Best Restaurants. Equally, Roganic, a two-year pop up by Michelin-starred Simon Rogan, and Dinner, Heston Blumenthal’s London outpost, also require your attention. But make sure you’ve left enough room and time for a reservation at Rules, London’s oldest restaurant, before you leave.